When you think of the full-load full-size luxury sedan market, which players come to mind first? The Mercedes S-class probably. The BMW 7-series. Maybe the Audi A8 and the Lexus LS? How about the Hyundai Genesis? If it didn’t show up on your list, can you think of a defensible reason why it didn’t? I’d never driven one before this, and I couldn’t wait to get into one. What I found was surprising. Click on any picture to see a larger version. And I do want to apologize. I make a big deal out of taking my own pictures whenever possible. One of my biggest pet peeves is car review(er)s that chronically use stock photography. Anyway, I’ve used stock pictures for the exterior shots, obviously. It was a perfect storm – between -30 C temperatures and a complete slushy mess on the streets and my insane schedule – and something I hate even more than stock pictures is dirty car pictures. I’ve done it before and I’ll do it again but I’ll try not to let it happen too often. The Genesis’ shape is deliciously classic luxo-sedan – short front overhang, long wheelbase, big honking trunk. It’s a premium looking automobile, to be sure, and sports refined, modern lines and strong character creases. They’re slightly offset by the boldness of the striking hexagonal grille and the eye-catching bracket-shaped LED driving lights surrounding the headlights. The rear end is handsome too, finished off with quad exhaust tips that make a quiet statement, as well as a set of cool LED tail lights. The wheel wells don’t suffer either, as they’re stuffed with massive 19-inch rims rocking some serious boots – 245/40s in the front and 275/35s in the back. There are no real low points in the car’s design for me, and that’s pretty unusual. This car gets lots of looks on the road, and I had plenty of onlookers asking about it. Of note – hardly anyone had ever heard of a Hyundai Genesis before. 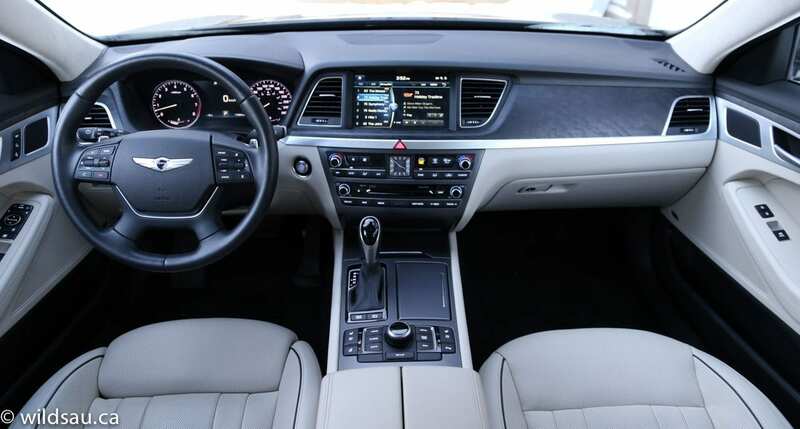 As you’d expect, Hyundai gives the Genesis a suitably large cabin, with decent head room – it feels even more spacious thanks to the huge panoramic roof. It is a truly world-class two-tone interior. The contrast between the light and dark is striking, and everything is soft-touch and textured nicely. Add the genuine open-pore wood trim, perforated leather trim on the door panels, genuine aluminum trim and the micro-suede-clad headliner and pillars, and it feels like you’re in mega-buck territory. These aren’t minor details. These are the real thing. Everything is illuminated with cool white LED lighting throughout. The one sore spot was the fake carbon fiber trim on the lower centre stack and centre console – it looks out of place and a bit cheap to me. 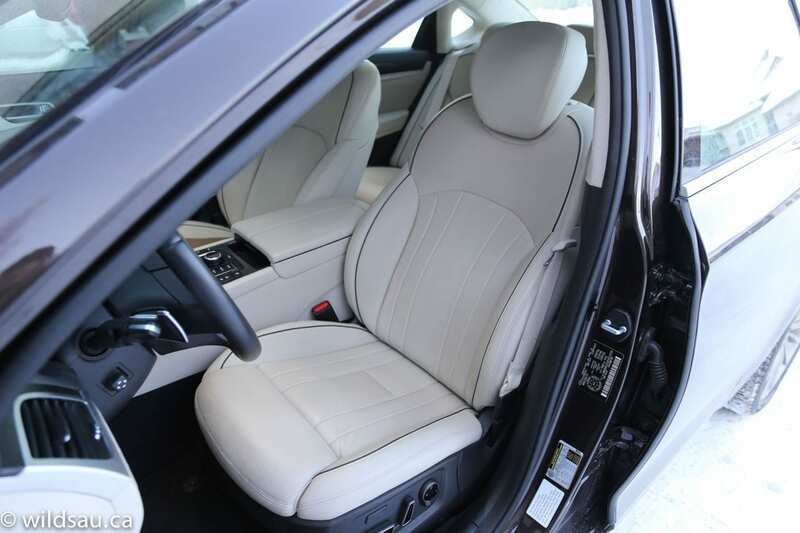 The heated and cooled seats are ultra-adjustable and very comfortable and even reasonably supportive. They’re also beautiful to look at with their luxurious Napa leather accented with black piping. The heated steering wheel was a nice touch for winter driving. The dash houses a large 9.2-inch touchscreen. 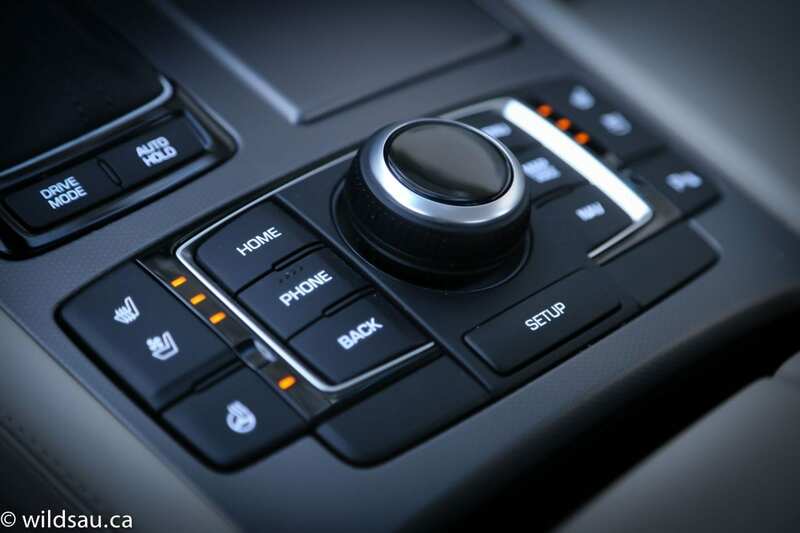 Its touch capability is augmented by a number of hard buttons for major functions, and a set of somewhat redundant-feeling hard buttons and a rotary joystick controller on the console. There’s nothing wrong with the whole interface, but it felt like a strange overlap of functions. Of course the car has navigation and the voice recognition system was exemplary. I found the 900-watt 17(! )-speaker Lexicon stereo to be outstanding. Crisp, clear highs; powerful, authoritative bass without being boomy. 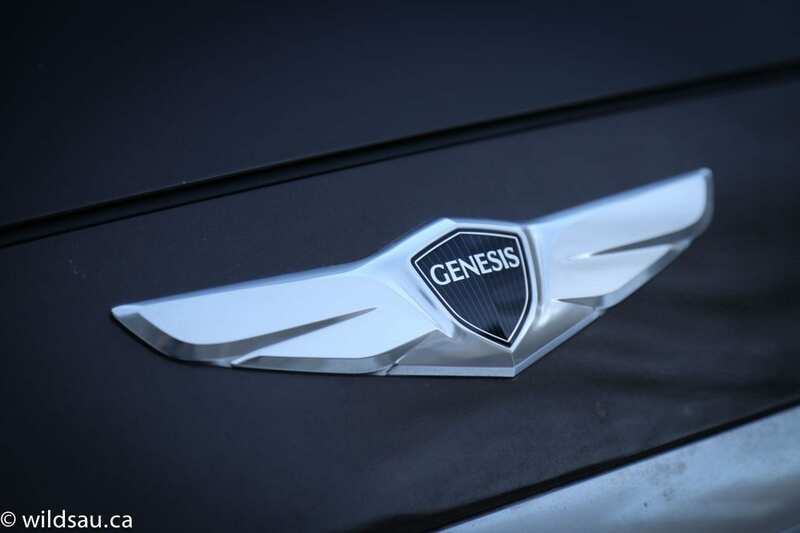 The Genesis, in this trim, leaves nothing to be desired in the driver assistance technology department. A full suite includes blind spot monitoring, rear cross traffic alert, lane departure warning and lane keep assist, adaptive cruise control (with stop and go capability), rear-view camera, front and rear parking sensors, and finally, a really well thought-out colour heads-up display which can include a ton of information (speed, nav directions, driving assistance indicators and the speed limit) without ever feeling too busy. Phew! 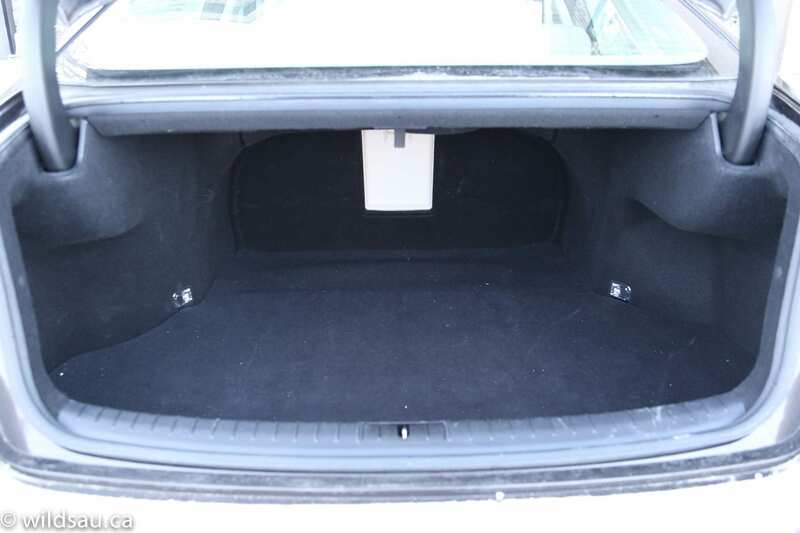 The trunk, at 433 litres, is large, but not huge and has a power trunk lid. 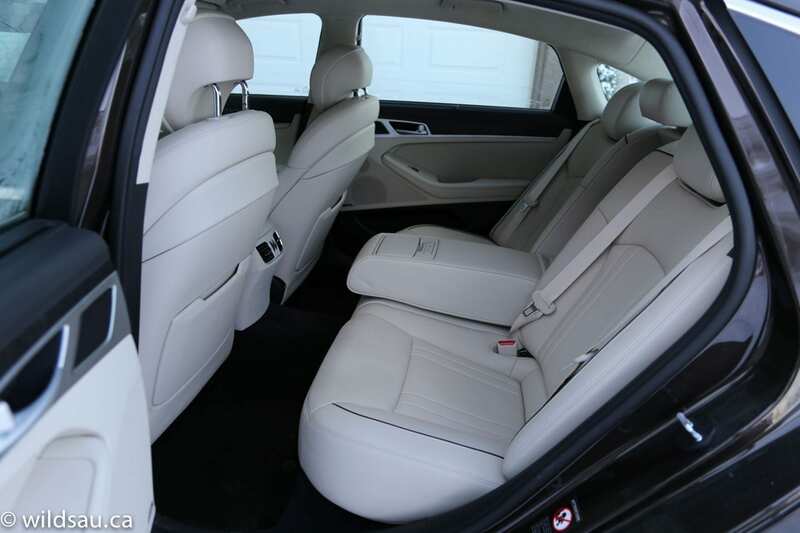 Of course, the rear passengers benefits from a very roomy space as well with limo-like amounts of leg room and foot room. Head room was also generous for me – I’m 5’10”. It’s a very nicely appointed place to be. There are three seats. Although the middle position is big enough to accommodate an adult, there is a large floor tunnel to contend with. Best then to transport two lucky people back there, and flip down that middle seat back. 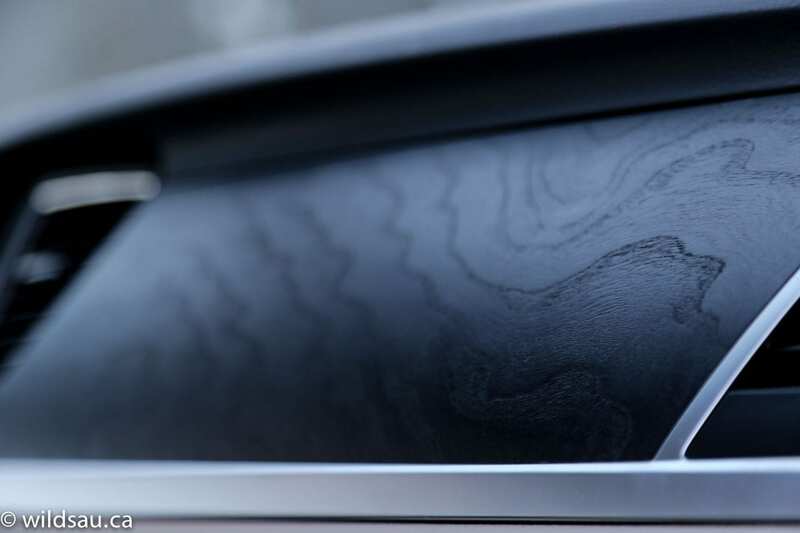 It becomes a long armrest with a couple of cupholders, as well as a console/control panel for your rear seat heaters and the powered rear sunshade. Yes, you could also have your driver do it from the dash if you’ve got your hands full with champagne and whatnot. A small taste of the proletariat life – you will be forced to raise your side window shades manually. 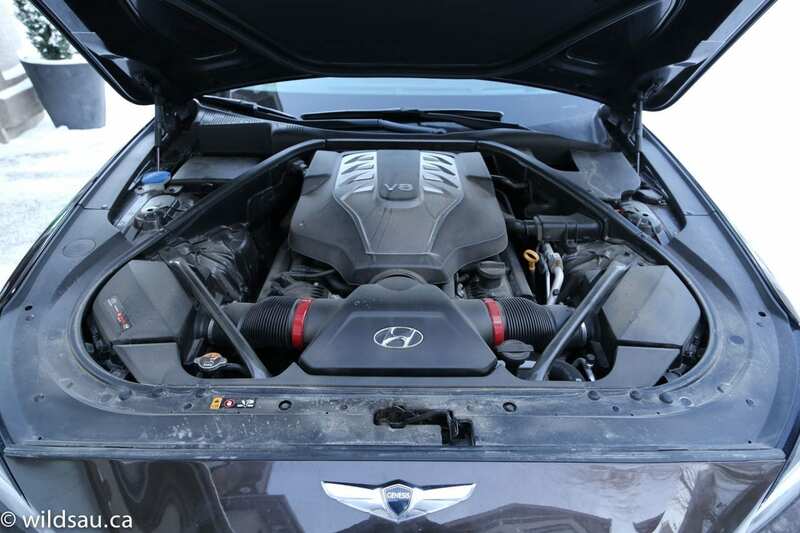 Here you’ll find Hyundai’s huge 5.0-litre Tau V8. It (or at least its shrouding) fills the engine bay properly, as any V8 should. Numbers are formidable for a normally-aspirated engine – 420 horsepower at 6000 RPM and 383 lb.ft of torque at 5000 RPM. 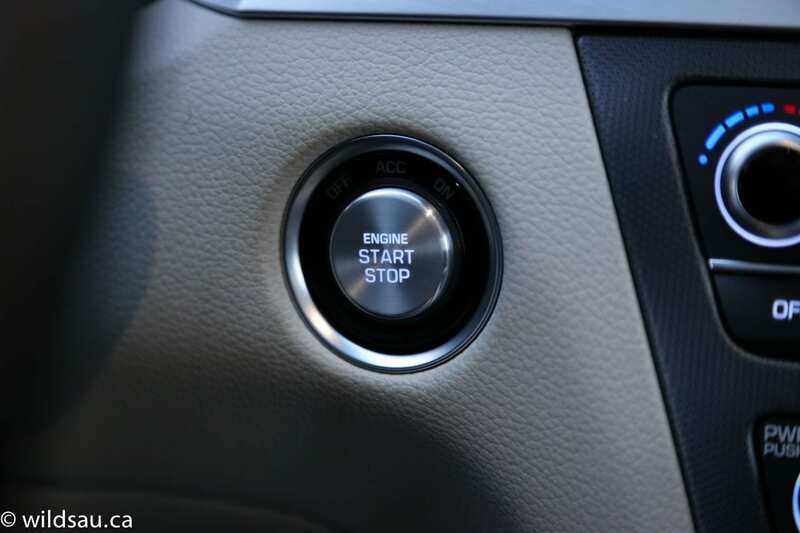 All that power is fed through a modern 8-speed automatic transmission and through a full-time all-wheel drive system. I appreciate that Hyundai doesn’t get carried away with the Genesis’ fuel economy ratings. Nobody is going to buy the 5.0 Ultimate trim and then question why their vehicle isn’t the most efficient thing they’ve ever driven. It’s rated at 17.3 L/100 km (14 US mpg) in the city and 10.5 L/100 km (22 US mpg) on the highway. I ended up averaging 15.7 L/100 km (15 US mpg) during mostly city commuting and slogging through a number of fresh snow falls. 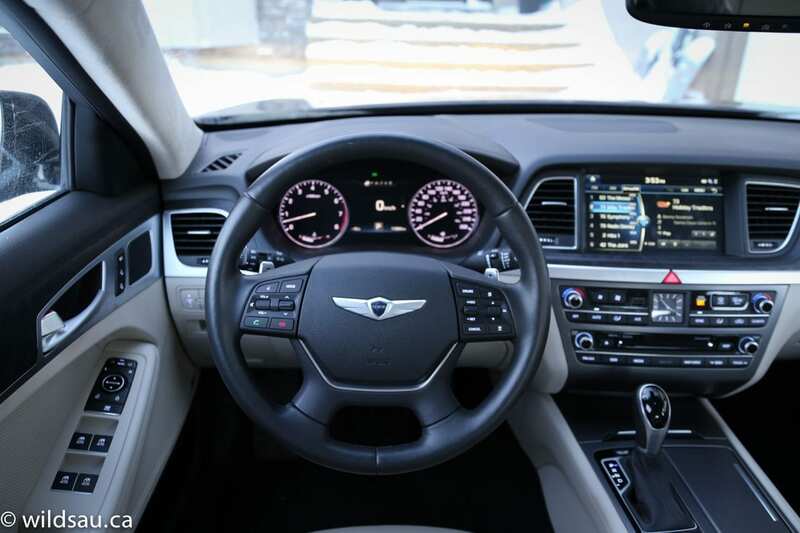 The V8 Genesis is clearly very powerful, but even in Sport mode and at full throttle, the power takes a couple of seconds to show up and then comes on so smoothly, that the car initially feels less powerful than it really is. Once the car is on the move, however, it builds momentum with tremendous alacrity. You’ll never really get that immediate kick in the pants though – they’ve kept the motions smooth and luxurious here. 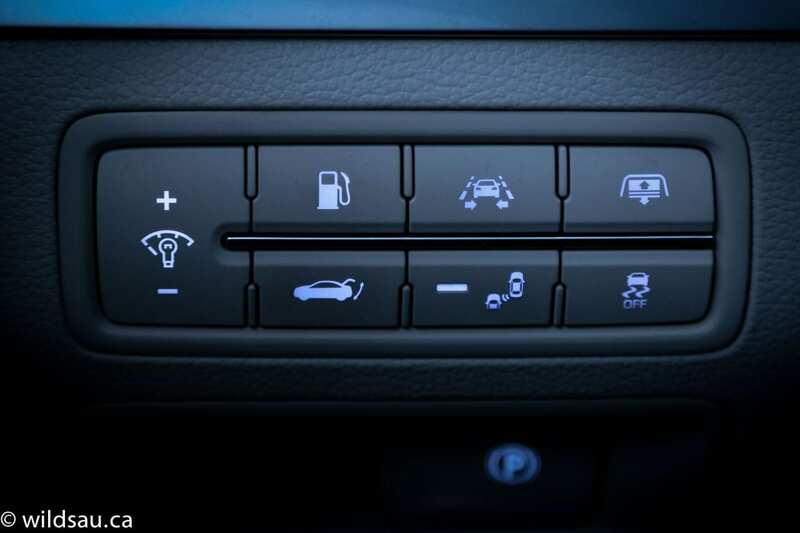 There are three modes – Normal, Sport and Eco. The 8-speed automatic is slick, never really letting you feel a shift. It does seem bent on saving fuel, jumping up the ratios quicker than I’d want it to in some situations, but for the most part, it’s where it needs to be. Gears can be shifted manually using paddles or the gear selector, but somehow it seemed uncouth to do so with this luxo-cruiser. The Genesis has continuous damping control for its front and rear suspension and the balance between ride and handling is suitable for this class of car. The ride is creamy and you won’t feel a single road irregularity, yet the car is responsive enough and controlled. Yes, there’s some body roll, but it’s minimal, and the car, for its great size (2143 kg – 4724 pounds! ), responds admirably to inputs. The steering is quite numb, but again, that’s fine for this kind of vehicle. I was endlessly impressed by how amazingly quiet this car was. Even at full throttle the engine is muted and distant-sounding, wind noise is a non-issue even at highway speeds and road noise never occurred – even big hits never come through the suspension and into the cabin. Hyundai’s HTRAC, which is 60/40 rear-biased, is very impressive. Considering I was floating along on massive summer tires, the all-wheel drive system virtually always came through in terms of grip and traction. Only the slickest ice patches gave it some trouble. I’d love to see what it could achieve with good winter rubber. The brakes are very powerful when called upon and visibility out of the car is excellent. 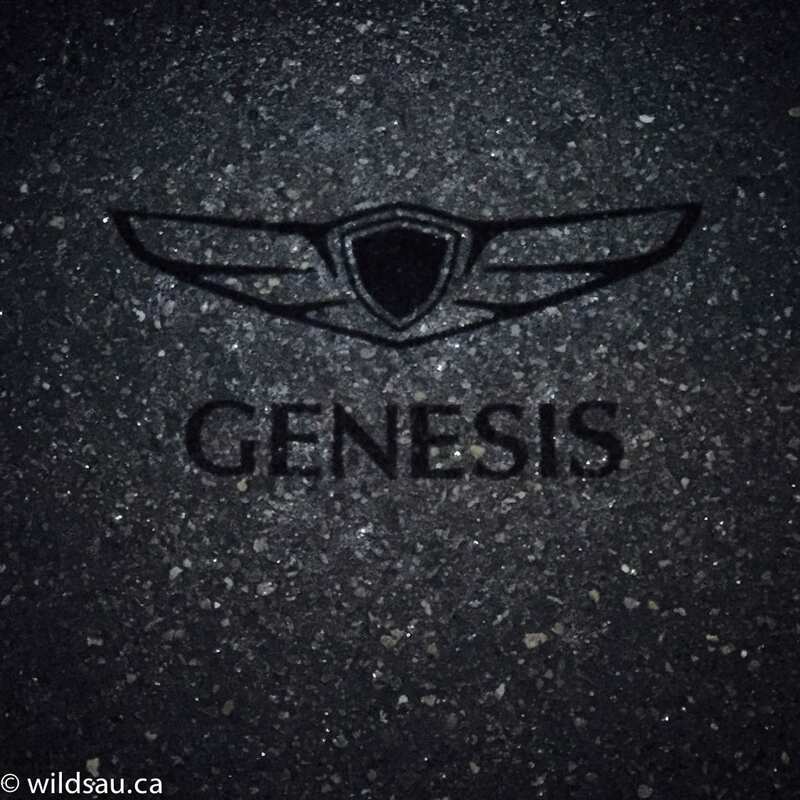 I loved the cool mirror-mounted puddle lamps that project a bright, white pool of light including the Genesis logo onto the pavement next to the car. Boy did that ever get attention in dark parking lots. If my thoughts thus far come across as glowing, it’s because they are. I expected a lot from this car, and most of my expectations were exceeded. 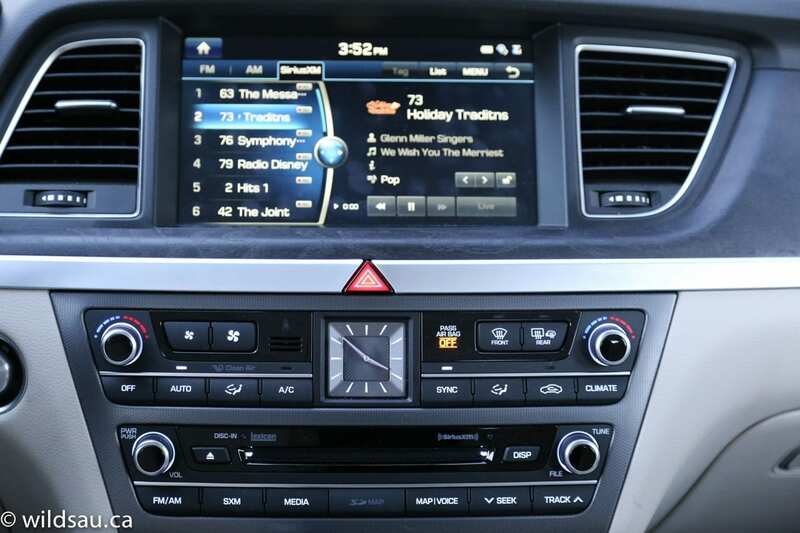 There is an incredible amount of luxury, comfort, technology and performance to be found in this top-trim Genesis. Truth be told, I heard a variant of “$62 grand for a Hyundai?!? !” a number of times during my review from passengers and onlookers alike. Yes, it’s expensive, but there’s no other car on the market that can compete at this price level. All Hyundai has to do is convince shoppers a) to get into the Genesis for a test drive and b) that their product is worth this much. I’d recommend giving it a try if you’re shopping in this category. You might be surprised. WAF (Wife Acceptance Factor) was very high. She felt it looked very expensive and that it drove that way too. It was bigger than she liked when it came to parking it, but otherwise, she loved it. I found myself thinking one thing after reviewing this car – other than realizing I loved it: Boy, Hyundai has learned a lot from the competition. It might not be long until the competition realizes they could learn a lot from Hyundai. Disclosure: Vehicle was provided by Hyundai Canada.